May 1 is the 121st day of the year(122nd in leap years) in the Gregorian calendar.There are 244 days remaining until the end of the year. Year 475 BC was a year of the pre-Julian Roman calendar. At the time, it was known as the Year of the Consulship of Poplicola and Rutilus. The denomination 475 BC for this year has been used since the early medieval period, when the Anno Domini calendar era became the prevalent method in Europe for naming years. 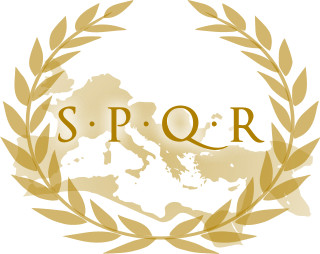 Publius Valerius Poplicola was consul of the Roman Republic in 475 BC and 460 BC, and interrex in 462 BC. John of Avesnes was the count of Hainaut from 1246 to his death. Arcadius was Eastern Roman Emperor from 395 to 408. He was the eldest son of Theodosius I and his first wife Aelia Flaccilla, and brother of the Western Emperor Honorius. A weak ruler, his reign was dominated by a series of powerful ministers and by his wife, Aelia Eudoxia. Benedict of Szkalka or Skalka, born Stojislav in Nitra (Nyitra), Hungarian Kingdom, was a Benedictine monk, now venerated as a saint. Saint Brioc was a 5th-century Welsh holy man who became the first abbot of Saint-Brieuc in Brittany. He is one of the seven founder saints of Brittany. Andeolus or Andéol was born in Smyrna in the 2nd century. A subdeacon, he was sent by Polycarp, along with Benignus, to evangelize southern Gaul. He went to the Vivarais. Septimius Severus, passing through that region, had him put to death. His head was stabbed with a gladius on May 1, 208, at Bergoiata, a Gallic settlement on a rocky peak over the Rhône River which would be later known as Bourg-Saint-Andéol. The body, thrown into the Rhone, was later found and placed in a sarcophagus by a rich Roman woman, Anycia or Amycia Eucheria Tullia, daughter of senator Eucherius Valerianus. His sarcophagus was rediscovered in 1865 during excavations in the St. Polycarp chapel of the eleventh-century church in Bourg-Saint-Andéol (Ardèche). Augustin Schoeffler (1822–1851) was a French saint and martyr in the Roman Catholic Church and a member of the Paris Foreign Missions Society. He was a priest in Lorraine who joined the Foreign Missions of Paris. He worked as a missionary to Indochina and was one of two French missionaries killed in northern Vietnam between 1847 and 1851. At the time, it was illegal to proselytize in Vietnam. 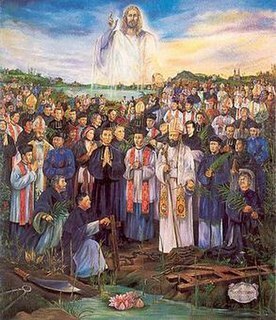 Jean-Louis Bonnard was a French Roman Catholic missionary to Vietnam, one of the Martyrs of Vietnam, canonized in 1988. May 12 is the 132nd day of the year in the Gregorian calendar. 233 days remain until the end of the year. ↑ The Imperial Dictionary of Universal Biography: A Series of Original Memoirs of Distinguished Men, of All Ages and All Nations. William Mackenzie, 22 Paternoster Row; Howard Street, Glasgow; South Bridge, Edinburgh. 1857. p. 699. ↑ Julian, John (1892). A Dictionary of Hymnology: Setting Forth the Origin and History of Christian Hymns of All Ages and Nations (Public domain ed.). C. Scribner's Sons. pp. 185–. ↑ "Troy, François de". Benezit Dictionary of Artists. doi:10.1093/benz/9780199773787.article.B00185626 – via Oxford Art Online. Wikimedia Commons has media related to May 1 .